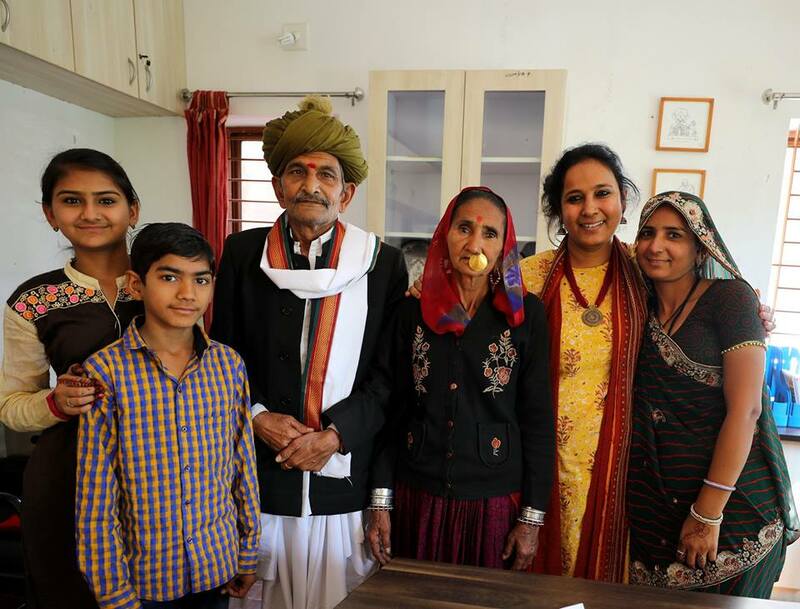 Janki and Bhoomi’s grandmother Vechima had tears in her eyes when she shared her sentiments with us. Vechi Ma is extremely proud of her daughter-in-law Kamlaben. It felt good to hear a mother-in-law appreciate her daughter-in-law so much. Infact, Kamlaben is truly a wonderful lady. She stays and works as cooking help in Deesa. The money earned is spent on sustaining the family. She definitely wishes that her girls study well and grow up to shine their family’s name. Janki and Bhoomi both aspire to become a doctor. They are moderate in studies but look forward to completing their education. “We do not have enough money to educate both our daughters. However, VSSM’s Shardaben has been instrumental in bringing these girls to the hostel. “My in-laws wanted to see where our girls are studying that is why I have brought them here. We are delighted to see them do well.” Kamlaben explained to us as a matter of fact. Naturally, a photo op with such fantastic family had to be mandatory!! These girls are Rajgour and study with 70 other girls in a leading private school of Ahmedabad almong with 70 other girls. Our well wishing friends, with their continued support have been helping us ensure girls like Janki and Bhoomi realize their dream. We will always remain grateful for this support. Hopefully, one day these girls will realize their dreams……. જાનકી અને ભૂમીના #દાદી વેચીમા આટલું કહેતા કહેતા રડી ગયા. વેચી માને એમની વહુ ને જાનકીની મમ્મી કમળાબહેન પર ખુબ ગર્વ. દીકરા કરતાંય વધુ વાત વહુની એમણે કરી. સાસુ વહુના આટલા વખાણ કરે એ ખુબ ગમ્યુ. જો કે કમળાબહેન વખાણ કરવા પડે એવા જ છે. ડીસામાં રહે ને રસોઈ બનાવાનું કામ કરે ને એમાંથી જે મળે તેમાંથી પોતાનો ગુજારો કરે. બે દીકરીઓ ભણી ગણી કુંટુંબનું નામ રોશન કરે તેવી કમળાબહેનની ઈચ્છા.